Is it valuable to judge another form of cultural performance on our own terms? Last Saturday I saw the famous Gansu Ensemble performing their Silk Road in London for the first time since it was revived for the 2008 Beijing Olympics. I had mixed feelings about the piece. I was struck by the focus on sheer spectacle – Silk Road was full of glitter and large ensemble numbers that did little for the storyline – I was perhaps expecting something subtler. In fact, I was expecting something very culture-specific to Northern China – something nuanced and highly technical – but I didn’t feel that was what was being presented by the ensemble. I found the imitative use of Thai and Indian dance forms a little difficult because they felt culturally insensitive, and the same goes for some of the costumes. Writing my review for this piece raised several questions for me, particularly pertaining to my position to pass judgement on such a production. Clearly, I came to Silk Road with different expectations than the majority of other viewers in the audience. I had quite a different reaction to another reviewer I spoke to, and I left the venue with ambivalent feelings. I didn’t enjoy the piece as much as I had hoped I would. Why? Had I got carried away with knowing that this was a particularly famous piece of dance-theatre? Or does my knowledge of Asian theatre and performance actually make me more judgmental? My overwhelming reaction was that the piece was little more than a spectacle pigeonholing “Asianness” and playing to stereotype. I found it very strange that a production that has toured the world for decades representing China is presenting the country like this. I must admit, it probably hasn’t been developed hugely since it was originally created in the late 1970s, and originates from a country that’s not exactly known for it’s respect for freedom of expression. It’s a complex topic and it was a memorable production – perhaps not for the intended purposes though. Nonetheless, I managed to write something reasonably concise that hopefully won’t offend anyone! Gansu Dance Drama & Opera Ensemble’s Silk Road is a colourful, vibrant depiction of an ancient Chinese tale, taken from the famed Dunhuang Frescoes of the Gansu province of China. 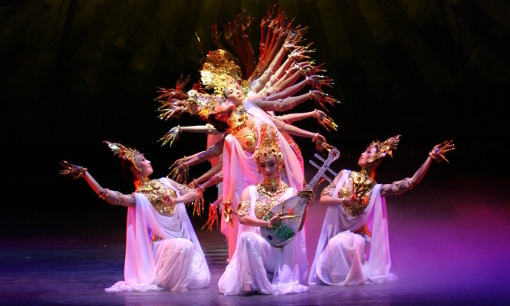 This production was originally created in 1979 by the then Gansu Opera and Dance Troupe as Tales of the Silk Road, and was adapted for film and toured around Europe and Asia in 1982. Silk Road was reconceived in 2008 in celebration of the Beijing Olympics, where it was performed in its current form by the Gansu Ensemble. The piece has been performed in 400 cities worldwide in the 34 years since its creation, but this is its first performance in London following the Beijing Olympics six years ago. Watching Silk Road in Sadler’s Wells’ Peacock Theatre in was a thoroughly enjoyable and unique experience. Follow the hyperlink in the title to read my full review on Bachtrack.